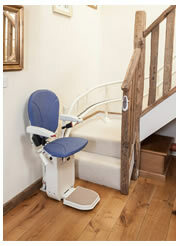 For those with economy in mind we offer a selection of used and reconditioned stair lifts. Electric as well as battery models are available as well as heavy duty and outdoor units. There are many variations of stairway configurations often requiring unique solutions. 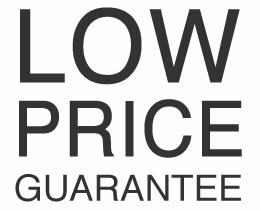 We promise to make your stairlift buying process as easy as possible, so call our Stair Lift Specialist at 1-800-910-0954 for a custom solution and guaranteed lowest prices. The AmeriGlide Horizon Stair Lift is a superior model that showcases all the latest in stairlift technology and innovation. 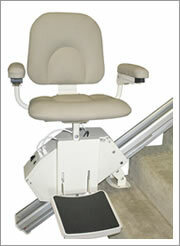 This battery powered stair lift is perfect for users who live by themselves and/or in an area that experiences frequent power outages. Powerful and long-lasting batteries will allow your stairlift to continue to operate even in the event that your home loses power. 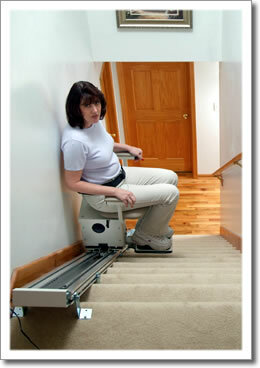 You will never have to worry about being stranded on one level of your home! 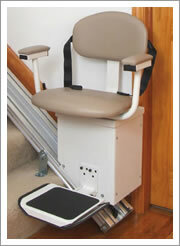 The AmeriGlide AC Rubex is a great option for those who are looking for a great bargain on a stair lift. The Rubex comes with all the safety features you'll ever need and takes away the hassle of dealing with a battery that has to be serviced. With a 300-pound weight capacity and 5 and 10 year warranties on component parts and drivetrain respectively, the Rubex is perfect for almost anybody. 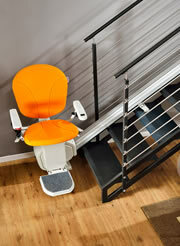 The Vesta is a new and improved stair lift by AmeriGlide. With a sleek new design and all of the same standard safety features of earlier models, the Vesta is a great addition to your handicap accessible home. In addition to the normal standard safety features, the keylock feature comes standard on the Vesta, which is great for homes with children. 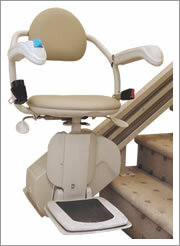 The Rave is another new addition to the stair lift line of AmeriGlide. Only sticking out from the wall about 11 inches, the Rave is perfect for homes with a narrow staircase or if you just want to maximize space. Even with a slimmer design, the Rave has a weight capacity of 350 pounds! The Rave also comes with all the standard features you expect from AmeriGlide. A dual-rail leveling system lets you navigate landings and curves smoothly--even 180-degree turns--while the security sensors stop the lift if an obstruction is detected. This safety feature, along with retractable seatbelts, a convenient swivel seat and a convenient joystick right in the armrest let you feel in control and safe every second. 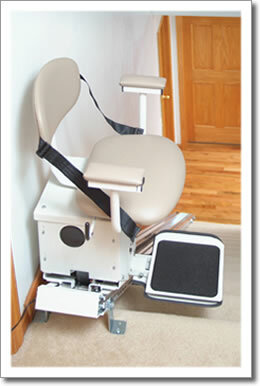 You don't even have to bend over to raise and lower the footrest thanks to a convenient handle or the option for a powered footrest. 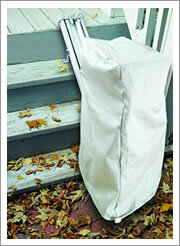 Based on the design for the standard AmeriGlide AC Stair Lift, the AmeriGlide Outdoor includes three weatherproof covers that will protect your lift from wind, rain, snow, ice, and other inclement weather. The AmeriGlide Outdoor meets all the same ASME safety standards as its other counterparts and can support up to 300 pounds of weight. The AmeriGlide Outdoor stair lift operates on any outdoor outlet that is equipped with ground fault interruption (GFI) circuit protection. 5-year warranty coverage on component parts and 10-year warranty coverage on the drive train is included with purchase.